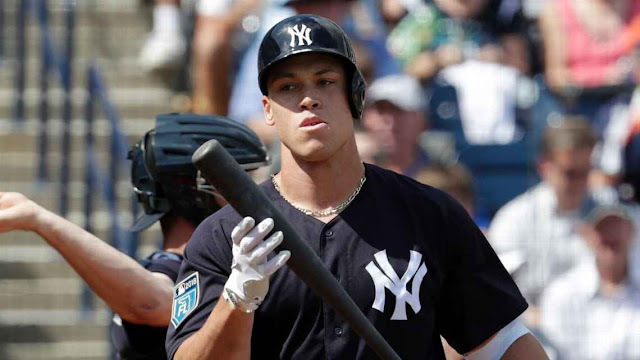 Bleeding Yankee Blue: COULD AARON JUDGE BAT LEAD-OFF? COULD AARON JUDGE BAT LEAD-OFF? I know you are as surprised as I was when I read that new skipper, Aaron Boone, batted slugger Aaron Judge in the lead off slot against the Red Sox on Friday. Yes it happened. The outcome? The Yankees lost 5-0, with Judge striking out in five pitches at his first at bat. Boone believes he could do this again, maybe even on opening day in Toronto. I'm shaking my head. I understand that you want your best hitter to get the most at bats, which is why you bat guys like Judge first. But Judge is way too green and much too impatient to bat lead off. I would not try that experiment again. And by the way, Judge is not the Yankees' best hitter, yet. "If I wanted to do something like that in the regular season, and if that's a real option, I at least wanted to introduce it," Yankees manager Aaron Boone said. "Because obviously it's a story today. So I at least wanted to get that part of it out of the way, and then we'll kind of evaluate and see where we stand going into the season with something like that," reported ESPN. Is it just me or do you have a hard time understanding Boone by way of his soundbites? The struggle is real for me, my friends. Judge was a good sport about the experiment noting that he may have batted first "in a high school game once." According to ESPN, "As the Yankees made their way back from a road game more than two hours away against the Minnesota Twins, Boone thought about how Friday would be a good time to tinker with his Judge-at-lead off experiment." I worry about the word, tinker. I wouldn't tinker with Judge, I would coach him to be the best hitter in baseball and drive in the most runs by placing him third or perhaps keeping him second in the lineup. Could Aaron Judge bat lead off? With Boone at the helm, don't be surprised if you see him there, as early as opening day. Although regular lead off batter, Brett Gardner, is slated to start the game in left, it is not etched in stone that he will bat first. I don't like the experiment. What do you think?